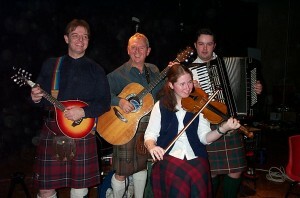 The Midgies Ceilidh band with Dance Caller is known for their high energy, West Highland sound and sense of humour. This is truly a band for all occasions including weddings, Ceilidhs, Graduations and corporate events, The band plays all the favourite ceilidh tunes with a caller who has a great sense of fun. The Glenhoulachan Midgie Club Ceilidh Band was formed over 20 years ago when Gordon Ross met John MacGregor and Billy MacPhee at the Wallace Day Celebrations in Elderslie, Scotland. John and Billy were with one folk band and Gordon with another. They discovered for the first time that they all lived within 10 minutes of each other in Dumbarton. In the case of Gordon and John they found that they lived in the same street, about 30 metres apart! The guys formed “The Midgies” to cover a few local gigs that had been thrown up by the demise of Billy and John’s previous band. The line up proved to be very popular and successful and so here we are, literally hundreds of gigs later still struttin’ our stuff. They are essentially a Ceilidh Band, however Gordon and John are “folkies” at heart and are equally at home performing the folk songs of Scotland.